1. Waning momentum? : Stock markets are looking flat after a record setting run in recent days. The Dow Jones industrial average, S&P 500 and Nasdaq all hit record high levels on Monday. 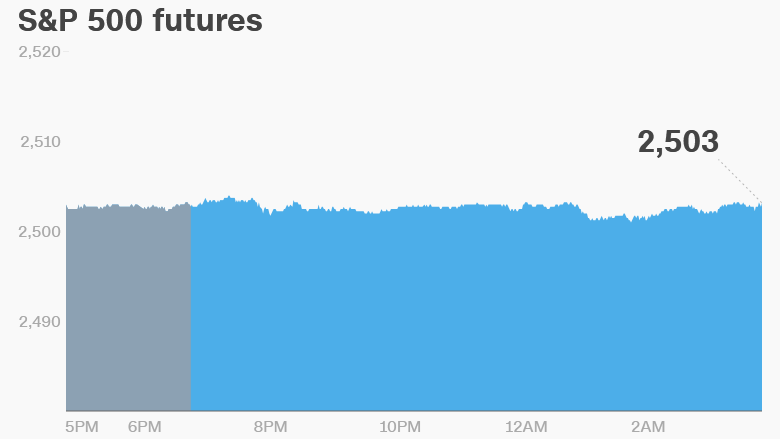 But U.S. stock futures were holding steady ahead of the open, and trading in European markets was relatively muted. Most Asian markets ended the day in negative territory. Japan's Nikkei index bucked the trend with a gain of 2%, closing at its highest level in over two years. Japanese exporters have been helped by a fall in the value of the yen. 2. No time for toys: Toys 'R' Us is filing for bankruptcy and that's causing a domino effect among toy makers. Shares of Hasbro (HAS), Mattel (MAT) and Jakks Pacific (JAKK) took big tumbles on Monday as investors anticipated the bankruptcy filing that came late in the day. The three toy makers each generated nearly 10% of their sales from Toys 'R' Us in their most recent fiscal years. 3. What to watch -- Trump, Equifax, Federal Reserve: President Trump is expected to address the United Nation's General Assembly around 10:30 a.m. ET. Wall Street will be watching for any market-moving comments. Investors will be watching Equifax (EFX) again. Shares are slated to drop by another 3% at the open as investors worry about continued fallout from a huge data breach at the firm. Equifax shares have dropped 34% since the breach was revealed earlier this month. And the Federal Reserve is beginning two days of meetings on Tuesday to discuss monetary policy. Markets will have to wait until Wednesday for announcements on interest rates and what the Fed plans to do with the vast stock of Treasuries and other securities it bought to spur the economy since the global financial crisis. 4. Earnings: Bed Bath & Beyond (BBBY) and FedEx (FDX) are the main firms that Wall Street will be watching on Tuesday as they plan to release earnings after the closing bell. FedEx was hit by a massive malware attack in late June, along with many other firms. FedEx warned that operations at its TNT Express subsidiary were disrupted and the financial impact "could be material." In Europe, Norway's giant sovereign wealth fund announced Tuesday that its investments are now worth $1 trillion. The government pension fund invests the country's oil wealth for future generations. 5. Economics: The U.S. Census Bureau plans to release data on housing starts and building permits from August at 8:30 a.m. ET. 6. Big merger in doubt? : An activist investor has built up a 15% stake in Switzerland's chemical firm Clariant (CLZNY) and is vowing to fight its planned $20 billion merger with Huntsman (HUN), another chemical specialist. White Tale Holdings, an investment partnership created by hedge funds Corvex and 40 North, has written to Clariant's board, urging them to rethink the deal.